The following recipes show how versatile crescent rolls and crescent dough sheets are. You'll find sweet and savory breakfast recipes, lunch and dinner ideas, and several tasty appetizers. 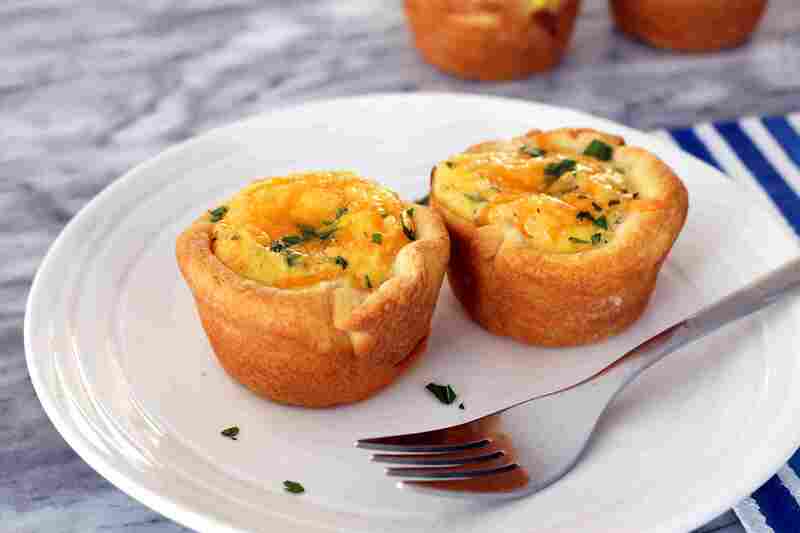 Whether you need a quick and easy breakfast for a holiday morning or something the kids can grab and run with, these little ham and cheddar muffin cup quiches are an excellent choice. Crescent roll dough makes the crust super easy to fix, and the egg filling takes no more than 5 minutes to prepare. This taco pizza blends the flavors of beefy tacos with all of your favorite toppings. The pizza crust base is super easy to fix and bake with two cans of refrigerated crescent rolls. The pizza makes a great appetizer or hot weather entree. Get the party started with these tasty little bites. Cream cheese, dried cranberries and walnuts team up to make the simple filling for these crescent roll appetizers. These little wrapped hot dogs are classic! Make them plain and simple or add slices of cheese. They're delicious appetizers that always please. To dress them up a bit, brush them lightly with egg wash and sprinkle with sesame seeds or poppy seeds. 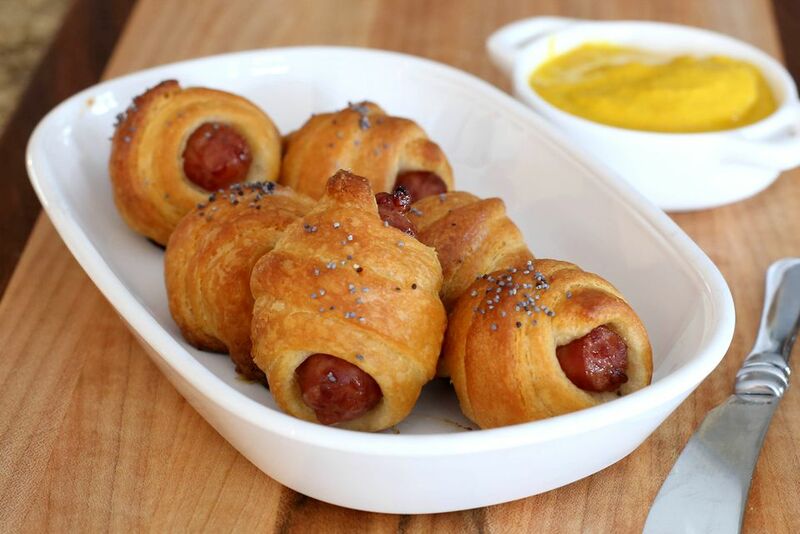 Make them with mini hot dogs or smoked sausages. Or cut standard hot dogs into 3-inch lengths. These whimsical raspberry-topped, heart-shaped Danish pastries are yet another way to use crescent roll dough (or puff pastry). Pizza sauce, finely chopped pepperoni, mozzarella cheese and mushrooms make a tasty pizza topping for the crescent roll dough. The dough is rolled up and sliced to make delicious little pizza pinwheels. Feel free to replace or add your favorite pizza toppings. What comes in a can and makes holiday baking a breeze? Crescent rolls! Here's another creative use for the convenient dough. The crescent roll dough bakes to golden perfection with a filling of bacon, eggs and cheese. Can you say breakfast bites? This creative beef stroganoff bake starts with a convenient crescent roll crust. The ground beef stroganoff mixture and some shredded cheese make this a satisfying lunch or dinner dish. This breakfast braid is another genius use of crescent roll dough. Fresh blueberries and sweetened cream cheese provide the filling. A simple lemon-flavored icing finishes the filled bread perfectly. These snacks are the bomb! String cheese is encased in the crescent rolls and baked with a savory butter, garlic and parsley coating. You won't believe these cheese Danish came from a can of crescent roll dough! For the topping, use berry jam, preserves or lemon curd. Bake these easy crescent roll cinnamon rolls for a holiday or weekend morning treat. Spread butter, brown sugar and cinnamon over the dough sheet and then roll, slice and bake! A simple powdered sugar icing is the perfect finishing touch. Add a dash of lemon or vanilla extract to the icing mixture if you like. These veggie crescent bites will surely be a hit. Seasoned cream cheese and sour cream make up the topping for a baked crescent roll crust. Use broccoli, diced bell peppers, green onions, cucumbers, and carrots to top the pizza-like snack. Or use a combination of sliced ripe olives, peppers, diced fresh tomatoes and onions. Use mini filo shells or rounds of crescent roll dough to make these fun pizza bites. Use pepperoni and cheese, or make them with vegetarian Margherita style toppings. Scrambled eggs, bacon and cocktail franks make up the filling for these tasty breakfast pigs-in-a-blanket. This ground beef pie tastes like a big all-in-one cheeseburger. The savory beef pie makes an excellent family dinner that everyone will love, kids and adults alike. Serve this cheesy bread along with a pasta meal or as a snack for family TV night. All you need to make it is a can of crescent roll dough, mozzarella cheese, Italian seasonings and Parmesan cheese.